Specializing in jewelry and watch repair. We are known locally for our superb jewelry restoration, custom design and fabrication. Have your wedding set be a one-of-a-kind! All original jewelry made by Randy Janis is on display and for sale at the store. Come in and visit, talk to the owner, you will appreciate the level of knowledge and expertise that allows all your questions to be answered on the spot. Educated in school in jewelry arts in San Francisco, Sacramento, Los Angeles under the tutelage of Chris Jeppeson, Master Jeweler extraordinaire of San Francisco. You can trust your valuable jewelry will be handled with the utmost care and finished to the highest standard. When you stop in the store you will talk to the owner and get expert advice on your jewelry, the same guidance Redding has come to expect from our hometown jeweler of 18 years. 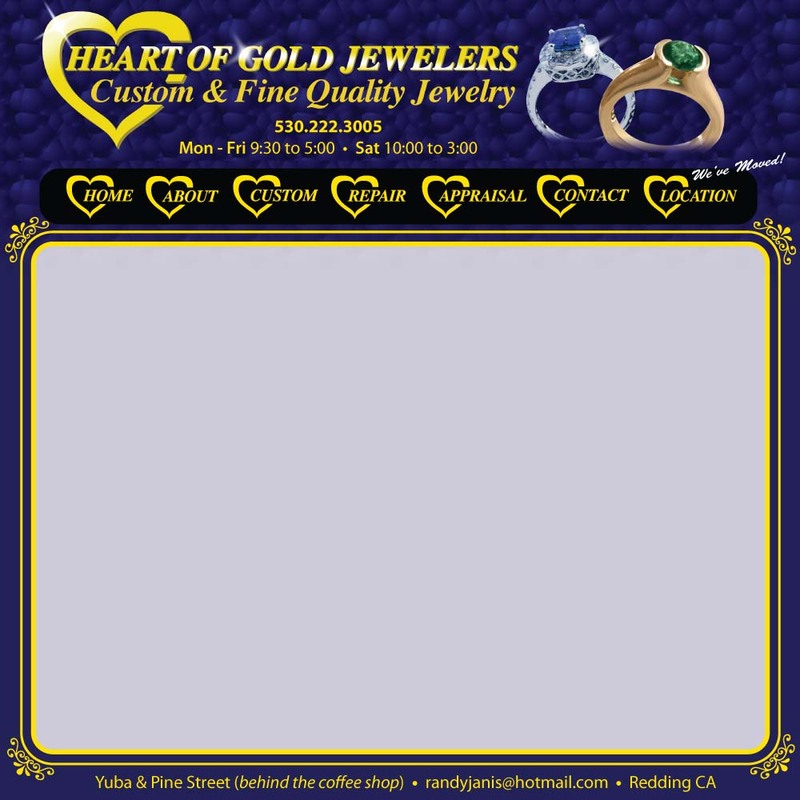 Heart of Gold Jewelers observes time honored craftsmanship with the experience and technology of today. Please stop by to see the finest selections of jewelry, watches and sunglasses. Webmaster Martin Horn at Martin Horn Creative Media Contact at mh@martinhornmusic.com © Copyright 2010 Heart of Gold Jewelers All Rights Reserved.